Plenty of conspiracy theorists about today following the announcement that Peter Varney will leave the club for "personal reasons" in June. I don't know why anyone feels they have to add that moniker on an end of a statement, I mean most decisions are made for personal reasons aren't they? I have had the pleasure to meet Peter on a couple of occasions and he is a top bloke. Have no doubt this is a man that bleeds Charlton Athletic and his role in taking the club on a journey from dark days to ones now of high expectation should never be understated. 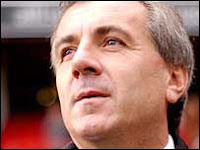 Varney was around the club in an unofficial capacity for quite a long time before Richard Murray "took something of a gamble in appointing" him as the club's chief executive over 10 years ago. In that time Varney's accomplishments are there for us all to see. Sure he made some mistakes, people that make decisions sometimes do, but the standing the club has within the game and the community is testament to his career at the club.